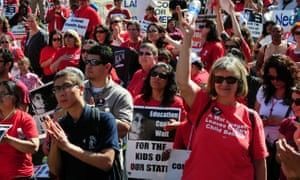 At the start of the 2018-19 school year, members of the Los Angeles teachers’ union overwhelmingly voted to authorize a strike, granting the union board the authority to approve a walkout as the union and school district continue to negotiate a new contract. The strike authorization provides the union with a possible tactic to leverage a variety of demands over the second largestschool district in the nation. This year, teachers have gone on strike in Arizona, West Virginia and Oklahoma with varying degrees of success. Arizona teachers received a 19% pay raise after a five-day walkout in May. West Virginia teachers ended their nine-day strike after receiving a 5% pay raise in March. Oklahoma teachers’ nine-day strike pushed their state legislature to pass an annual $6,100 pay increase and devote $500m to education funding. The United Teachers of Los Angeles, the union of the city’s public school teachers, are demanding the school district increase education investment, hold charter schools accountable, take efforts to reduce class sizes, improve school safety and reduce the quantity of mandated standardized tests in addition to increasing wages by 6.5% for teachers. “It seems clear talking to over 1,000 teachers in the district that the big issue for teachers in the Los Angeles unified school district is class size, easily at the top of the list. It’s gotten out of hand,” said Elgin Scott, a teacher at Los Angeles’ Taper Avenue elementary school, in an interview. According to Scott and other teachers the Guardian spoke with, it’s not uncommon for classes to have more than 30 or 40 students. “The district says they’ll reduce class sizes, but a provision in the current contract gives them an out. All they have to do is claim financial hardship, show no proof and they make the class sizes what they want,” said Scott. The large class sizes undermine the ability for teachers to properly do their jobs, provide individual attention to students with a wide range of needs and pose a fire safety risk, the teachers argue. “When you’re doing labs, that’s 40 kids doing labs in a class without a sink. Imagine doing that five or six times a day. A lot of science teachers don’t really do hands-on stuff because there are too many kids,” said Julie Van Winkle, a math and science teacher at Logan Span school. Los Angeles teachers also face an overabundance of mandated standardized tests, undermining the quality of education they can provide students. “Testing is in the front seat and it doesn’t belong there. The problem with testing is we’re doing too much of it, a lot of it unnecessary and a lot of the tests are one-on-one,” said Victoria Casas, a teacher at Beachy Avenue elementary school. She cited the Dibels exam mandated three times a year, mandated exams for ESL students, midterm assessments, and Sbac exams as some of the tests she is required to give her students. During one-on-one exams, she has to come up with work assignments for the rest of the students that are easy enough to do on their own without interrupting the test, but challenging enough to provide some value, all while the rest of the students can listen to the questions and answers provided by the student during their exam. Though the school district spends a significant amount of money on a variety of standardized tests, teachers are financially burdened with paying for necessary materials out of their own pocket. “My wife and I both teach and we’ll do $6,000 to $7,000 dollars a year between the two of us, not including the donors choose program on top of the money we spend,” noted Elgin Scott. Despite being the fifth largest economy in the world, California’s spending per student has regularly ranked from 37th to 50th in the country over the past several years, depending on the criteria used to rank states. The union and public education advocates have called for an increase in per student funding to $20,000 by 2020 in Los Angeles. The current per pupil spending in the Los Angeles district is roughly half that. This lack of spending, in addition to forcing teachers to spending money on materials out of their own pocket, limits resources students are provided within the schools, like art teachers, school nurses, counselors, psychologists and social workers. One of the reasons for the lack of funding for the Los Angeles unified school district is the growth of charter schools in the area. An estimated $600mannually is lost to charter schools within the district, as per pupil spending is lost when a child leaves a public school for a charter school. In California, charter schools are also allowed to inhabit any unused public school space, meaning charters and public schools sometimes share campuses, which drains resources from public school students and divides students, parents and teachers at both schools on the property. As teachers, students and parents continue to grapple with the wide range of issues facing the school district, there remains a looming possibility of a teacher walkout if the Los Angeles unified school district and its leadership don’t reach an agreement with the teachers union. The district’s leadership includes superintendent Austin Beutner, a former investment banker with no education background whose appointment in May 2018 was opposed by the teachers union. The union has rejected several of Beutner’s bargaining proposals since a strike was authorized, characterizing his agenda as favoring privatization and charter schools. A spokesperson for LAUSD told the Guardian, “LA Unified remains committed to resolving the issues through the mediation process.” The contract negotiations remain in mediation between the union and the school district. It remains unclear when a contract will be agreed upon, or if a teacher strike already authorized by the union will ultimately be used as a tactic during the negotiations.